High-carbon stainless steel blade: Our wenfeng professional 8 inch chef’s knife is made from high-quality stainless steel which has a good degree of sharpness and excellent anti-rust properties. This knife has a razor-sharp, laser-tested, tapered edge. It’s ground to form an exacting angle to ensure maximum cutting performance and long-lasting durability. The blade also contains a certain amount of chromium, which enhances the knifes sharpness and also improves the anti-rust properties of the blade. Ergonomic Design: The handle is made form high quality pakka wood making it comfortable to use and ensuring a good grip. The weight and the size are well balanced, so you won’t feel it’s heavier at one end, and makes it easier to use. This makes it ideal for frequent use in any kitchen. Ultra-sharp & Durable: The blades sharpness is further boosted by use of the latest German engineering to help ensure it will remain this way (ultra sharp), even after tough tasks, such as cutting tough meat or boning meat. Package Design & Lifetime Warranty: The professional chef knife is packaged in a gift box which makes it a very suitable gift for friends. Storing this away correctly and safely will help to protect you and your family; especially children. Our Lifetime Warranty and No Questions Asked Return Policy: Takes the risk out of your purchase and lets you focus on the important stuff; A.K.A. Your Life. Although our 8-inch kitchen knife is designed with professionals in mind; including chefs, culinary experts, food caterers, it can be used by anyone. 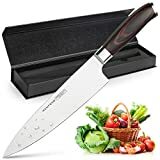 The WENFENG professional 8 inch chef’s knife will provide you with the results you require and the strength and durability that’s needed in any kitchen tool.